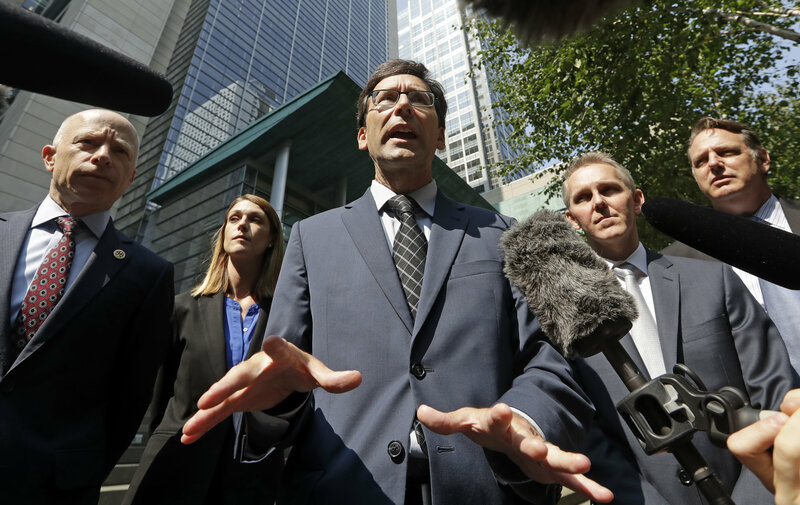 “There is a possibility of irreparable harm because of the way these guns can be made,” said Seattle-based U.S. District Judge Robert Lasnik, who issued the order. Ferguson was one of the eight Democrat attorneys general who filed suit for the temporary restraining order. Overall, 21 states have petitioned the the federal government not to allow the release of the blueprints. However, Utah was not among them. Alliance for a Better Utah, a political watchdog group, issued a statement Tuesday blasting Utah Attorney General Sean Reyes for not joining the fight to keep the plastic gun blueprints out of public hands. Sen. Mike Lee also came into the crosshairs of the group for blocking the advancement of proposed legislation in the Senate that would ban blueprints for 3D-printed firearms. In an era of mass shootings, it shouldn’t be any easier for criminals to get their hands on dangerous firearms. Like many Utahns, we were extremely concerned that 3D blueprints for the manufacturing of handguns, semi-automatic rifles, and magazines were made available on the internet for download. The obstruction by Senator Lee to block legislation that would ban such blueprints is incomprehensible. And the silence from Sean Reyes’ office is deafening. We deserve elected officials who are front and center in protecting Utahns, not officials standing in the way or nowhere to be found. According to the Wall Street Journal, Lee argued that the legislation to ban the blueprints violated constitutional free-speech protections. The National Rifle Association, whom Trump tweeted he had spoken to about the potential release of the blueprints, also issued a statement Tuesday noting that plastic guns were already illegal in the United States. “Many anti-gun politicians and members of the media have wrongly claimed that 3-D printing technology will allow for the production and widespread proliferation of undetectable plastic firearms,” said Chris W. Cox, executive director of the NRA Institute for Legislative Action. Making it difficult for every loser to make a gun on their own is just good common sense. While SCOTUS has never to my knowledge ruled on a action like this there are constitutional SCOTUS backed legal limitations to free speech when that “speech” is deemed obscene or a potential danger to the public or others. Many would argue that “irreparable public harm” would also result from the publication of books and material detailing how to make things like pipe bombs. Yet “The Anarchists Cookbook” has been available for many years. It can also be argued – by people who feel it is common sense – that books detailing ritual methodology for killing children would also cause such harm. Yet the Bible is commonly available. Items such as “Meine Kampf” are also available, translated into many languages. A book beloved by many here – the Book of Mormon – talks about many things that are considered heresy by other, more numerous, mainstream Christians. Some of those ideas are considered very dangerous by others. Since they are in the majority, should they be able to declare it a source of “irreparable public harm”? They would feel justified in doing so, and they have their reasons to prove it, and they have far greater numbers. I won’t go into detail about how you equate “losers” with gin ownership, but I’d recommend that you consider the unintended consequences of what you are supporting. It’s easy to support the Constitution and the Bill of Rights when you agree with the freedom being exercised. It really counts, however, when you support the freedoms you don’t agree with – especially when those freedoms were intended to protect the ones you do care about. For the record, I don’t equate losers with gun ownership. My family owns guns. Lots and lots of guns. None of them are losers. Enlighten me. What are the unintended consequences of making it that much harder for every felon, criminal, scumbag, and deluded loser to make a gun their own home? You pointed it out for yourself. You need to look at the basis for this situation. It is not the physical manufacturing of something. The basis of this situation is the publication of information. What other information should it be illegal to publish, and who should be allowed to decide that? That’s one of the fundamental issues resolved in the Bill of Rights. I don’t agree with all of your examples but I fear your conclusion is valid. I’m not sure how this is going to play out but the current injunction is just a stop gap until the hard questions are debated in court. You’re in luck. The very liberal 9th circuit, of all places, just issued a ruling that individual citizens do have the Constitutional right to not only own guns, but to open carry them. I suspect SCOTUS will be making a decision on this in the next year or two. There’s a difference between being able to carry them and make them at home. You can carry any gun you want to, however you want to but I draw the line at you being allowed to make them at your house. So YOU draw the line? I see. What about the Bill of Rights, which does not agree with you? You see, when you begin to attack one right because YOU FEEL (that’s the basis of your stance) that even the possibility of the exercise of another right might be “too dangerous”, you open the door for others that FEEL differently to do the same. That’s where the unintended consequences of this go. To clarify, free speech can’t be infringed simply because of a “potential danger to the public or others.” The test according to Bradenburg vs Ohio is much stricter and requires speech “directed to inciting or producing imminent lawless action and is likely to incite or produce such action.”. The publication of 3D printer blueprints doesn’t remotely meet those parameters given the critical elements of incitement and imminent action. The court could create new findings on speech but that is highly unlikely. Lower courts will have to work off of existing laws and precedent which will be challenging and more likely deal with the nuances of gun production and concealment laws. Its going to be years before this is settled though. Don’t we have more important problems to solve in this nation – such as our out of control national debt? If only we print some 3D brains and insert them into some of these hard-leftist nutters/loons. I would assume that non-leftist brains would be used in the algorithm of printing 3D brains for the ultra left hardliners. Wouldn’t you think so? So agree, only as a boomerang toward your thick, small forehead. 3D plastic guns are not detectable through xray. So if they do ever get through to the general public Im hoping you and yours get stuck on an airline with some nutbag carrying. Ya know peeps, this is nothing new, it’s just that their using “new” millennial style technology. Anyone with even a High School Machine Shop class under their belt and a few basic home handyman type metal machines can make a gun out of plastic or metal. It’s not hard to do and you don’t need blueprints and a 3-D printer.